Are you looking for a new podcast to listen to? I just heard about a fun one called Wow in the World. In this podcast, hosts Mindy and Guy have funny conversations about science news. This is a hilarious way to learn about dinosaurs, astronauts, animals, technology and more. Mindy and Guy are friendly, energetic, and they love science. They want to make sure you love it, too! Go here to give it a listen. Come back and let us know what you think in the comments. Meet Chirp readers Lily and Matteo, ages 4 and 2. 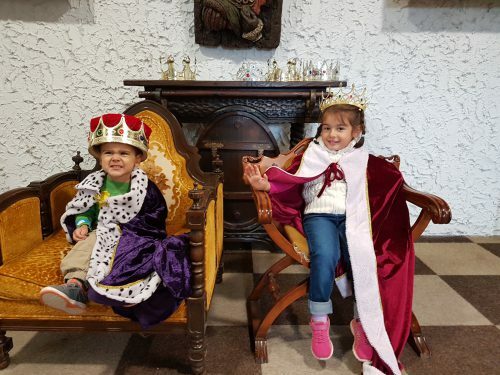 Lily and Matteo read the October Castles issue and were inspired to take this awesome photo. Great photo, Lily and Matteo! I hope you had lots of fun playing dress-up. Do you have photos you want to share? Send them to chirpblog@owlkids.com. Are you ready for another Reader Art post? Here it is! This drawing was sent to us by Chirp reader Nuha, age 5. Thanks for sharing, Nuha! Great use of colour. Do you want to see your art here? Send it to chirpblog@owlkids.com. It’s time for another Reader Art post! 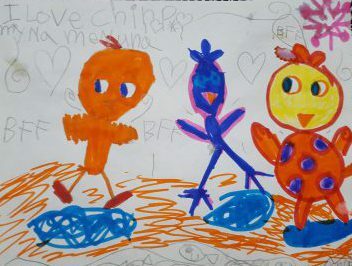 Today we have a drawing from chickaDEE reader Finn, age 7. 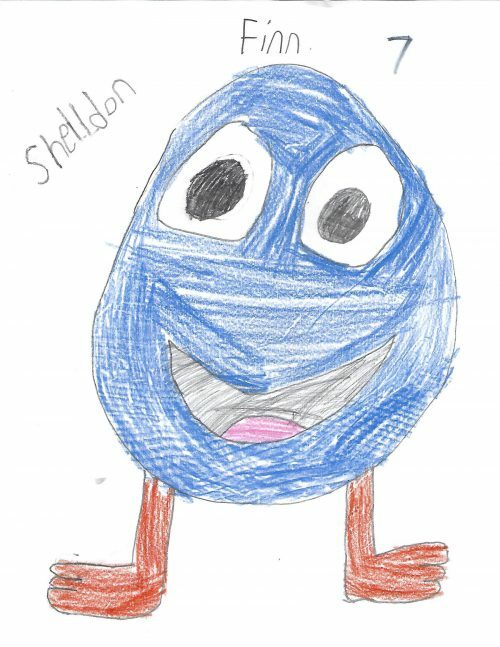 Finn drew this awesome picture of Shelldon. Great job, Finn! I love how happy Shelldon looks. Thanks for sharing. Do you have art you want to share? Send it to chickadeeblog@owlkids.com. Thanksgiving is coming up! Here are some fun would-you-rathers to ask your family this weekend. …eat a whole turkey by yourself OR a whole pumpkin pie? …eat Thanksgiving dinner on a giant trampoline OR while riding horseback? …put mashed potatoes in your hair OR go swimming in cranberry sauce?